4L260 FHP V-Belt. 1/2” W x 26" Overall Length. Industrial Grade. GATES 2260/4L260 Truflex V Belts, Gates Powerated 6826. Metric GATES 4LXP655 (Snow thrower OEM). Craftsman: 504193, 8142, RP052AX, RP80966. MTD: 754-0219, 754-0292, 954-0219, 954-02926. POWER SMART 2 STAGE SNOWBLOWER BELT. Toro: 1575, 271-72, 3-6593, 3-8093, 7-11856. A24 Belt. Classic A-24 V-Belt. Replaces 4L260 FHP V-Belts. A24 Belt. Classic A-24 V-Belt. 1/2" Wide, 26” Length OC (660mm). 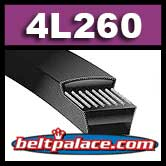 Replaces Standard Raw edge A24, 4L260 FHP V-Belts. 4L260K Kevlar FHP V-Belt. Consumer Brand. 4L260K FHP V-Belt. Aramid/Kevlar Consumer Brand. 1/2” W x 26" Length. Replaces Classical A24K V-Belt on light duty applications.